Steven (Chicagoland, United States) on 22 February 2012 in Cityscape & Urban and Portfolio. What's Old Is New Again #3.....Pictured above is a re-post of a shot that I captured back in 2010. Looking back at some of the photos that I processed in HDR (high dynamic range), I could see how "overprovessed" they were; to a point that it is embarrassing to have posted. So I present to you this image more "tastefully" processed. The American flag captured on the Wrigley Building for the Fourth of July holiday. Photo captured on July 2, 2010. This is really beautiful - Excellent work on the re-do. Oh, to feel that kind of sunshine again... And I love Chicago street names! This certainly is a great improvement. The light is very natural and the colours and detail are stunning for this quintessential big city view. Yes, I'm amazed at the improvement, the major part being the saturation and the ability to now lose the halo effect. As I said yesterday you now have over a year's worth of additional experience, and it shows. A beautiful city scape and marvelous light and colours. Beautifuly captured and presented. a pleasure to see all these details! an extraordinary compo and I specially like this bright atmosphere again! superb! Always a great composition and excellent opportunity to revisit the processing. This version captures the natural light beautifully. 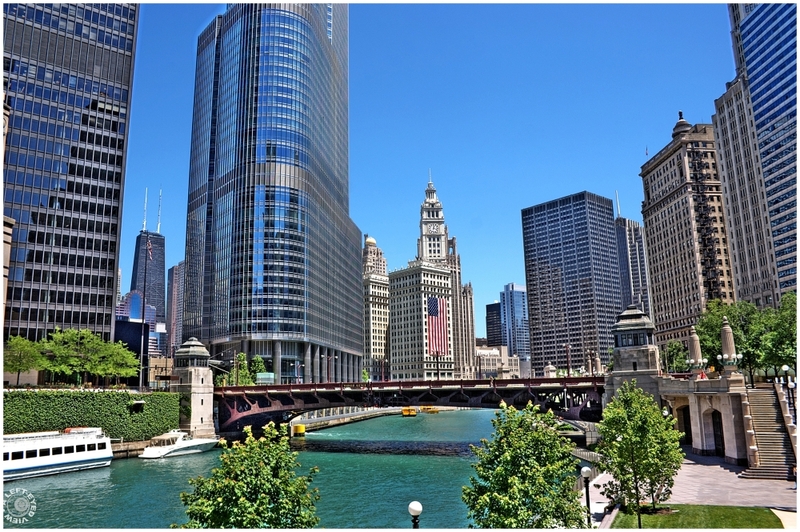 Magnificent view of the Chicago River. Superb colors. You managed to get the John Hancock in the frame. Fantastic cityscape and view...a very beautiful day too! Great shot! Great capture of this Cityscape. Bravo! Beautiful cityscape. Great POV and processing! and you succeeded - this is a very nice HDR. As a rule, I HATE HDRs.......I think I'm allergic to them, in fact. But this one - it has that right balance that makes you ASK "is that HDR or not?". Bravo! Is the water really that color? Beautiful cityscape. Oh, so much better, Steven - this is truly a beautiful image that wasn't at all enhanced by the overprocessed HDR look. I'm so happy to see you using HDR processing in a much more subtle manner. Well done! I like the height buildings with the river in the center. Looks really nice there. I have never been there.